To listen to Frank and I PodCast click here. Over looking the ocean in the south part of Nathan Beach, in the North Province of Phuket Island, I sweated through my Ashtanga practice on a Tuesday in late October. The chosen spot, The LifeCo Phuket Detox Center Beach Bar, I had just washed, as the cement floor provided solid foundation compared to the soft sand. While I had hoped that practicing at the Beach Bar would draw attention, the Rejuvenating Juice and Organic Coffee Bar, with its beauty enriched snacks, made from raw and natural ingredient that leave your taste buds wondering why you have not been eating this way all your life, was still preparing for the high season opening. Though that night I would start teaching Free Yin Yoga on the beach, so I figured it could be a fun idea to practice outside and possibly talk to passerby tourists. Imagine my elation when a young man came up when I stood up from Savasana (final relaxation pose) and inquired about my practice and the Beach Bar. 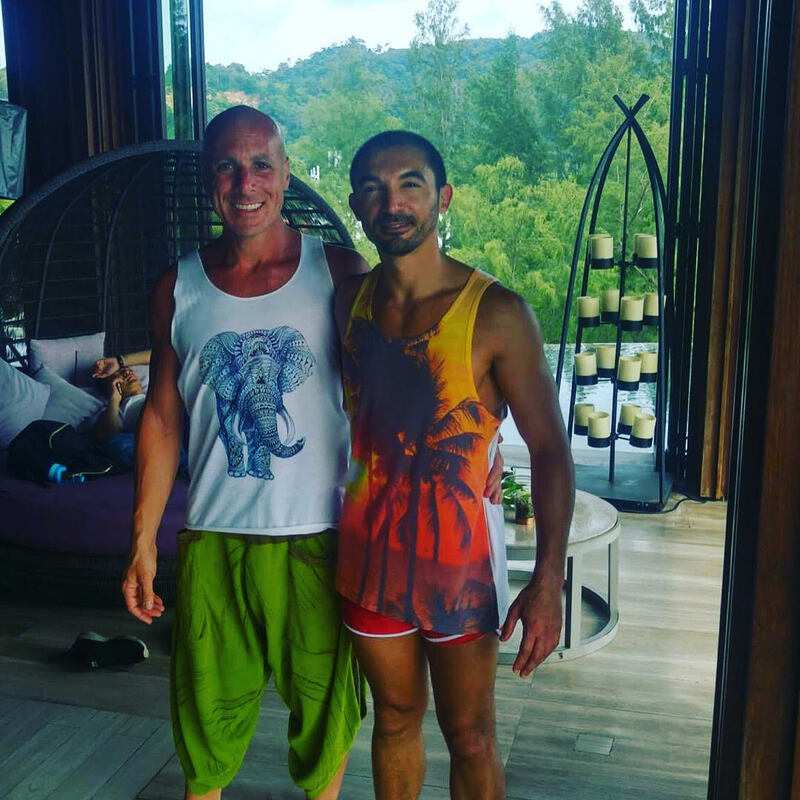 Turned out that Frank, the young man who approached me, is a Yoga Teacher out of Melbourne, and he and his friends on their first visit ever to Thailand. They chose Thailand as a meeting place for a long due reunion. Imagine my surprise when I realized Frank was not in his twenties. While they could not make Yin that night, they all came the following evening for a gorgeous view and expanding yin sequence on the beach. With my PodCast interviewing male teachers, Frank agreed to be on the show, and we sat outside at the pool of Pearl of Naithon where they had rented a stunning villa allowing everyone to be together, yet their own room. Having never seen the inside of the property, I found myself in awe. The high season has not started and there was only two families at the pool, the sound of the children around us, along with birds chirping and the warm wind provided the perfect background for the PodCast. Frank shares incredible insight into the value of meditation, stepping out and just teaching wherever you can, as well as taking advantage of practice in varied places. His journey into teaching through apprenticing for 2 years is really inspiring! Tips for teachers and students alike, this PodCast beams with joy and laughter. Frank can be found at Salt Yoga Studio in Melbourne, Australia. Be sure to follow him on Instagram (@saltyogastudio) as well, where you can see more photos from our post PodCast interview. Frank Bonnici has been practicing yoga for 15 years and teaching since 2010. He is experienced in teaching Hatha, Vinyasa, Slow and Power Flow, and Yin yoga. Frank holds a strong focus on postural alignment, core strength, breath awareness, and movement, all of which are encouraged and explored throughout each class. More recently Frank has turned focus towards a ‘restorative practice’ to counteract the daily stresses many of us live with. Frank Bonnici undertook a 2 year yoga apprenticeship with his mentor Johannes Mochayedi. From Johannes he learned that a great teacher is one who not only challenges the students, but also listens and supports them in their practice. Frank also undertook further study in aureveda and meditation under the guidance of John Ogilvie & Swami Pujan at their Byron Bay yoga centre. Yoga is a continuous learning practice; the knowledge is endless, the journey an infinite one. Frank always encourages his students to listen to their bodies and their own needs. Adjustments and corrections are one of Frank's forte. The world around us throws us many challenges, and our lesson is how we react both physically and emotionally. Frank is a strong believer in exploring your own yogic journey. He will help you explore how you breathe, how you move and pause in this world, how to welcome the energy that nature offers and the subtle art of awareness.